On Monday, prosecutors charged a white man with manslaughter in the death of an unarmed black man who was shot outside a Florida convenience store in July. Ruth Beltran, an organizer with Black Lives Matter Tampa, told Radio Sputnik's By Any Means Necessary that many US laws disproportionately affect communities of color because they are rooted in white supremacy. 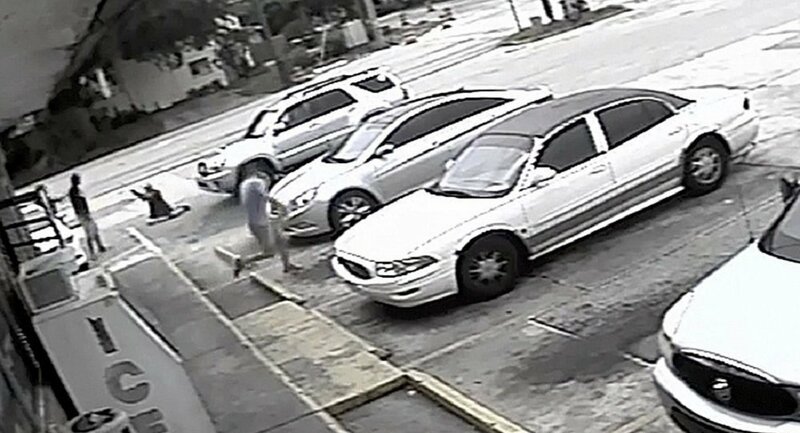 ​On July 19, 28-year-old Markeis McGlockton drove to a Clearwater, Florida, convenience store to buy some snacks. He parked in a handicapped spot, leaving his girlfriend, Britany Jacobs, and two of his kids in the car. He took his 5-year-old son inside the store with him. While the two were inside, Jacobs was approached by 47-year-old Michael Drejka, who yelled at her for parking in a handicapped spot without a permit, Sputnik reported last week. Store surveillance footage then shows McGlockton rushing out of the store and shoving Drejka to the ground in what appears to be an attempt to protect his family. Drejka is then seen in the video sitting up and reaching to his hip for a weapon — a concealed handgun, for which he had a permit — and pointing it at McGlockton. As McGlockton retreated, Drejka fired a single shot at his chest, according to Pinellas County State Attorney Bernie McCabe. McGlockton is then seen stumbling into the convenience center before collapsing to his death in front of his 5-year-old son. ​The Pinellas County Sheriff's Office has said that Drejka is protected by Florida's Stand Your Ground law, which allows people to use deadly force if they fear "imminent death or great bodily harm." They aren't required to try and escape the situation. However, on Monday, prosecutors charged Drejka with manslaughter. He is currently being held at the Pinellas County jail on $100,000 bail. Court documents also reveal that the July altercation is not the first time Drejka has aggressively accosted people for what he believed to be traffic infractions. "We feel very hopeful that Drejka was finally charged, as he should have [been] from the beginning. Now, we need to not lose sight of what's happening and continue to put pressure on the state attorney to make sure that he does his job properly and secures a conviction in this case," Beltran told hosts Eugene Puryear and Sean Blackmon. ​"I really believe that the pressure that everyone put on the state attorney actually made him be able to charge Drejka for the murder of Markeis, even though it's not a murder charge. I know, we as activists, were supporting and working with the family… the family [McGlockton's family] is very happy for the news. It looks like what could be some kind of justice in this case," Beltran continued. "We will continue to put pressure on the state attorney just to make sure he does a good job. Based on the cases we have seen nationwide, we know that sometimes we do have an arrest, but later the state attorney ends up dropping the ball once we are at trial. We need to ensure that doesn't happen, that the state attorney does what he needs to do to secure a conviction in this case," Beltran added. Following McGlockton's death, a vigil and protest was organized by the Clearwater/Upper Pinellas County Branch of the National Association for the Advancement of Colored People. More than 150 people attended the event urging for justice in the death of McGlockton. "It is important that people mobilize," Beltran told Radio Sputnik. "It is important that when the government is not taking the steps it needs to take, in this case to hold Drejka for the murder of another member, that we mobilize and we don't let it [the incident] get swept under the rug like it does in many cases," Beltran added. According to Beltran, the Stand Your Ground law, which was extended last year in Florida to allow people to use deadly force outside their homes or vehicles, needs to be reviewed and revised. "I still do believe that Stand Your Ground does need to be reviewed and revised. Just the extension that they passed on that law last year [has allowed] people to claim Stand Your Ground outside their own homes, which has resulted in incidents like this one. I think that's part of the law that needs to be addressed. It has a lot of loopholes and allows vigilante type of people to go around instigating trouble and then claiming Stand Your Ground as their defense," Beltran said. "It all ties back to white supremacy," Beltran noted. "A lot of Americans like to talk about laws we have in place. However, laws, systemically for the most part, are enforced in a racist way, a way that disproportionately affects communities of color." "That [Stand Your Ground] law doesn't stand alone, even when it comes to regular tickets that people get when they are driving their cars. All of these laws are disproportionately affecting communities of color, and that, I think, is the root of the problem and what we need to be targeting. [We should be targeting] not just one particular law but the system itself," Beltran said.